You may notice that the row numbering style has changed from the style of our previous graphs. This is because I’m using a new graphing app–details on its wondrous powers to come! This new app numbers every 5th row for the banner-style design, but numbers every row for the square-style design. I have not yet figured out why it does this, or if there’s a way to change this, but some numbers are better than no numbers. Note that these graphs are still designed to be worked starting in the lower right-hand corner. The row numbers restart the count at the corners, but you can still keep going. They’ll be correct as long as you start in the lower right-hand corner. I’ve tried to mix up the design release so that the most popular houses (like Stark, Targaryen, and Lannister) are scattered every other week or so. This way, you’ll have a week or two for crocheting before another one of your favorites becomes available! 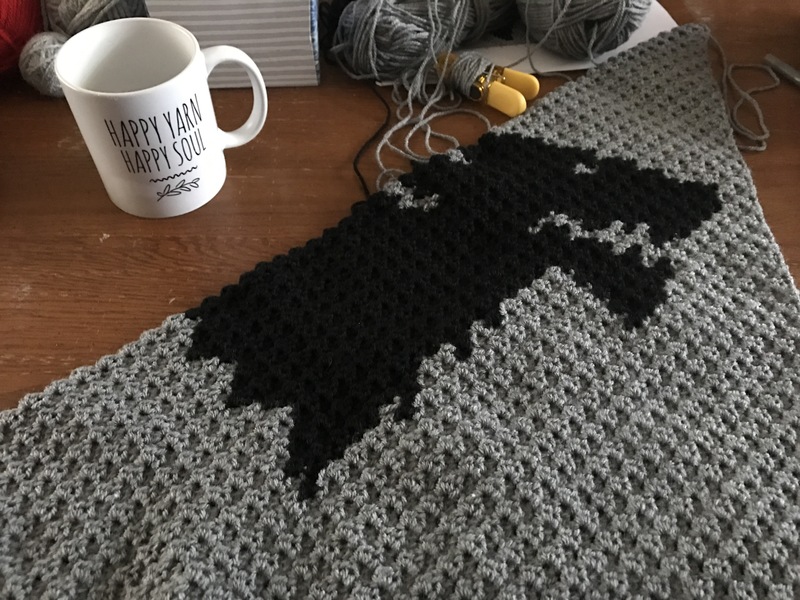 Time to get back to work on my Stark banner–happy crafting! Hi I really want to do this CAL for my brother for Christmas but I’m in the process of moving 2and half hours away from current home running back and forth like a chicken with its head cut off and the only connection to internet I have right now is my phone. Sorry TMI my question is how long will these awesome patterns be available? These patterns will be available for as long as humanly possible, so no worries! Thank you so much!!! Can’t wait to get settled and organized enough to start!!!!! I am desperately needing to win the lotto! I have at least 6 projects started and now I want to start this one! 😩 I think I can fit this beautiful CAL in with the others. 😬 Thank you so much for putting your time and effort into all these wonderful graphs. This would be my very first graph and CAL and i’m very excited to do it. I have a few questions before I begin. I would like to do it in SC or HDC instead of mini C2C., which one would work best? would it come out the same size or bigger when doing it as SC or HDC?. I would like to do all the houses and words would i have to make it smaller to be able to do it? I’d recommend doing a test swatch in sc and a test swatch in hdc and see which you like best. Personally, if one block on the graphs is one stitch, I think sc would work best. You’d also be able to do all of the houses that way and not end up with too large of a blanket (although that’s still a lot of houses, so it could still be large!). You can always size down a hook and see how you like that, too. I’d recommend doing a test swatch of 5×5, then measure the height and width. Multiply the width by 10 (this will tell you approximately how long the width of the full panel will be) and multiply the height by 15 (this will tell you the height). Then you can figure out how large each House banner will be and see how large your blanket would be on the whole! Lots of information there, but I hope it helps! Hi, there looks like there’s a mistake in the Stark Sigil. Thank you! Was just about to correct the mistake myself.